Gigabyte decided to go with a slightly more sensible solution and one that has a bit of future proofing thrown in for good measure. What you're looking at is a PCI Express to mini PCI Express adapter which takes a standard half-size mini PCI Express card, in this case a card based on Atheros chips. The unusual thing with this adapter is that it has a USB pin-header that attaches to the USB pin-header on the motherboard. This is for the Bluetooth 4.0 part of the card, while the Wi-Fi part connects over PCI Express. There's also a USB port on the card – a feature we've never seen before – to which you can attach any USB device with a standard USB connector, a neat addition that we're sure plenty of people will find useful. 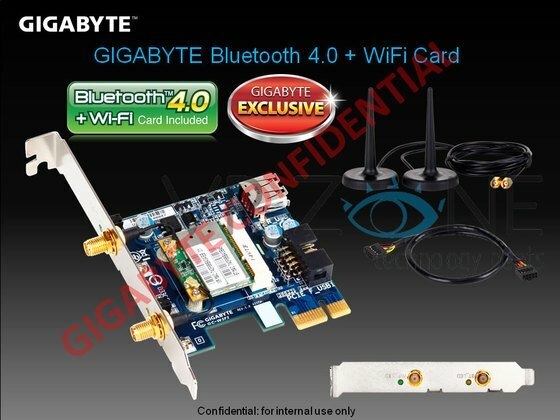 The Bluetooth part of the card is compatible with Bluetooth 3.0 + HS as well as the low power Bluetooth 4.0 standard. For now very few devices are available that supports Bluetooth 4.0, although the iPhone 4S is one of the first devices out there that officially supports the standard.